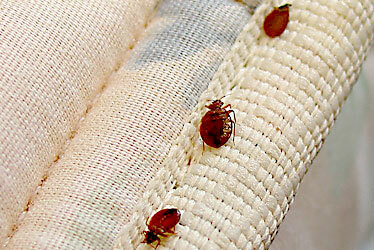 Bed bugs are small parasitic insects that feed on the blood of mammals and birds. Adult bed bugs have flat bodies about one-quarter of an inch in length; they are copper colored and wingless. Young bed bugs are nearly colorless and very small (1/16th inch). Bed bugs do not fly; they either crawl or are carried from place to place. When a bed bug feeds, its body swells and becomes bright red, making it appear to be a different insect. In homes, hotels, or other dwellings, bed bugs feed primarily on human blood, usually at night when people are sleeping. Bed bugs are not known to transmit disease. 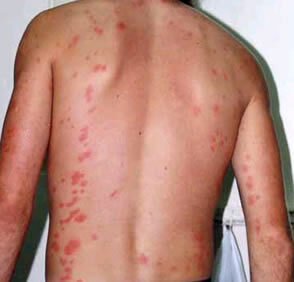 However, bed bug bites can cause large, itchy welts on the skin. A person’s reaction to insect bites is an immune response and therefore varies from person to person. Bed bug bites are usually painless and rarely awaken a sleeping person. If people are sleeping side by side, one person may have a severe reaction while the other shows no evidence of being bitten. Sometimes the red welts caused by the bites will not be apparent until many days after a person was bitten. If there are bed bugs in your house, you may notice itchy welts on your or your family’s skin. You may also see the bed bugs or evidence of their presence, such as small bloodstains from crushed bed bugs or dark spots from bed bug droppings. Bed bugs are found most often around areas where a person sleeps or rests. and in clutter around sleeping areas. In more severe infestations, bed bugs may spread to cracks and crevices in bed frames and box springs and be found behind headboards, inside nightstands, and behind baseboards, pictures, and moldings. It is important to inspect furniture adjacent to sleeping areas for the presence of bed bugs, as well as behind loosened wallpaper. Bed bugs may also hide in piles of books, papers, boxes, and around pet sleeping areas. The typical life span of a bed bug is about ten months. They can survive for weeks to months without feeding. Bed bugs will feed on pets, but prefer to feed on humans. Pet sleeping areas should be inspected and treated by a licensed pest control company. Time and money can be wasted attempting to eliminate an infestation if an insect is not identified properly. Controlling and removing bed bugs involves different procedures than the removal of other pests and will require multiple visits. A pest control professional should perform a thorough inspection, and when bed bug hiding places are found, provide at least one chemical or non-chemical means of control to the infested rooms every two weeks, for a total of three treatments. A professional may also use pesticides and specialized equipment, such as steam cleaners, to kill the bed bugs. It is important to cooperate fully with all of the pest control company’s recommendations. These recommendations may include washing clothing and linens and reducing clutter in infested rooms. All materials removed from a bed bug infested room should be placed in plastic garbage bags before being thrown away or taken to a laundry facility. This will prevent bed bugs from being moved to other areas of the structure. Licensed applicators should provide proof of their licensure and their company’s licensure upon request. Visit http://www.pestboard.ca.gov/license.shtm or call DCA, Structural Pest Control Board at (916) 561-8704 to confirm that the company is certified. How does a property become infested with bed bugs? In most cases, bed bugs are moved from infested areas to non-infested areas on clothing, luggage, furniture, or bedding that is brought into homes. How can I prevent bed bugs from entering my home? Some infestations can be prevented by washing clothing and bedding immediately after returning from a trip. Inspect all used beds, box springs, sofas, upholstered chairs, and bedding for signs of bed bugs before bringing them into your home.